You created your space with patience. Now protect it with purpose. Retractable screens from Fenetex have been perfected through 20 years of innovation. Designed for the ultimate ease of use, Fenetex products deliver optimal comfort and protection with none of the usual maintenance or installation headaches. These are the strongest, most reliable, and most durable motorized screens for residential or commercial use. Retractable Insect Screens: Your outdoor space should be your sanctuary. Fortify it from insects with our Fenetex Retractable Insect Screens, ideal for protecting residential and commercial patios, garage door openings, cabanas and outdoor kitchens from pests of all kinds. Clear Weather Curtains: A beautiful outdoor space should be an asset no matter the weather. Perfect for restaurants with covered outdoor seating, our Clear Vinyl Weather Screens protect against high winds and fluctuating temperatures without obstructing the view of the outdoors. This all-weather solution is fully adjustable and can be deployed or retracted at the push of a button. Retractable Hurricane Screens: When a hurricane is in the forecast, most people spend hours preparing outdoor living areas for the storm. But with Fenetex Retractable Hurricane Screens, you can rest assured everything will stay protected. Made from aramid and polyester fiber (the same materials used in ballistic body armor), our hurricane screens protect outdoor areas comparably to aluminum roll shutters without blocking out light. Dual Screens: Fenetex Dual Screens combine a stronger-than-steel hurricane screen with an insect or shade screen for comprehensive protection from the elements. Our exclusive, custom-engineered track system allows you to deploy either screen at the push of a button, so you can enjoy your outdoor space no matter what. All Fenetex products are inspected according to a rigorous in-house quality assurance program and certified by multiple agencies within the industry. 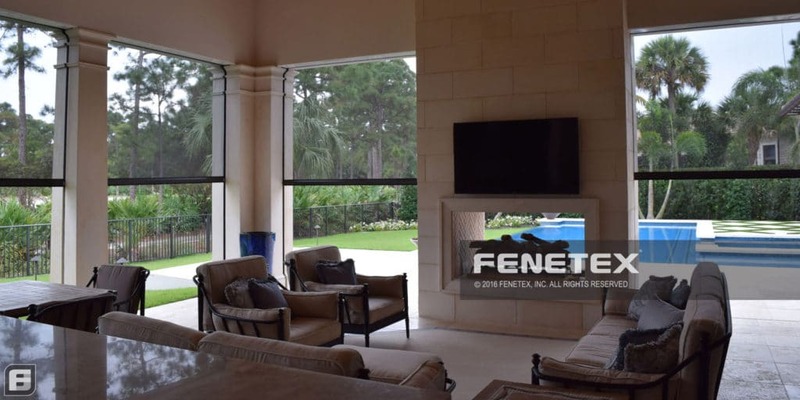 Discover all of our retractable screen products from Fenetex!